Dispersion relations for surface waves and attenuation parameters in a crystal with the impurity monolayer adsorbed on its top are studied. We consider a face-centered cubic crystal with central interaction between the nearest neighbors as a model and calculate the value of m*0 for the adsorbed surface monolayer. Beginning from it (m0 < m*0), the surface wave splits off the upper edge of the volume spectrum and attenuates non-monotonously (with oscillations), when penetrating into the crystal bulk. J.V. Barth, G. Costantini, and K. Kern, Nature 437, 671 (2005). V. Ferrari and R. Lucklum, Piezoelectr. Transduc. and Applic. 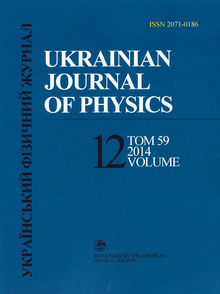 39, 40 (2008). Chemical Sensors: Comprehensive Sensor Technologies. Vol. 4. Solid State Devices, edited by G. Korotchenkov (Momentum Press, New York, 2011). G.P. Alldredge, Phys. Lett. A 41, 281 (1972). I.M. Gelfgat, Fiz. Tverd. Tela 19, 1711 (1977). M. Voinova and M. Jonson, in Chemical Sensors: Comprehensive Sensor Technologies. Vol. 4. Solid State Devices, edited by G. Korotchenkov (Momentum Press, New York, 2011), Chapt. 9. A.S. Kovalev and E.S. Syrkin, Kristallogr. 44, 865 (1999). E.S. Syrkin and I.M. Gelfgat, Fiz. Nizk. Temper. 12, 525 (1986).